On 1 January 2018 MiFID II will introduce new requirements for systematic internalisers (SIs) dealing on own account on an organised, frequent, systematic and substantial basis outside a trading venue when executing client orders. The new requirements apply to pre-trade reporting, quality of order execution and post-trade reporting. Euronext’s managed SI service is a hosted order matching solution enabling you to meet MiFID II SI obligations quickly, with lower capital investment and fewer dependencies on your internal IT resources. Whether your priority is attracting new clients, optimising flow from existing clients, or simply reducing your cost of compliance, if you are registering as a new SI or migrating an existing venue, we can take care of the technical and operational details. SI registration (MiFID II Art. 4 & Delegated Act as of 25 April 2016) MiFID II introduces specific quantitative thresholds that determine whether a firm is obliged to register as a SI for a specific instrument or derivatives class. We offer a low-cost, fully hosted solution to operating a SI venue if you are obliged to register. Pre-trade reporting (MiFIR Art. 15 & 18) Public quotes for liquid equity and equity-like instruments are required for all instruments for which you are a SI. This can be done by using Euronext’s APA service, while our SI pre-trade reporting service publishes your quote information over the global SFTI® network. Quote and trade matching (MiFIR Art. 15 & 18) As a SI you are required to execute client orders at the price being quoted at the time of reception of the order. Our SI compliant architecture includes low-latency feeds from industry leading data vendors that can be used to generate the executable quotes. 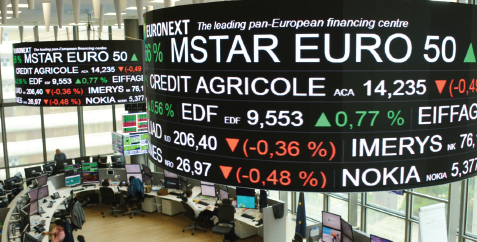 The service is operated using the same technology, infrastructure and security processes used for Euronext’s regulated markets. Already installed in a Tier 4 data centre and integrated with the global SFTI® network, this gives you and your clients the highest levels of service and security confidence irrespective of geography. Services are fully managed against formal SLA from our European market control centre in Paris. Service levels are monitored in real-time and reported monthly. Typical on-boarding time for a new SI is four months and the minimum service commitment is just one year.